The roots of US Airways go back to 1939, and All American Aviation Inc, based in Pittsburgh, flying passengers and airmail up the Ohio river. Slowly expanding, it changed name in 1953 to Allegheny Airlines. It entered the jet age fairly late, with the Douglas DC-9 in 1966, and carried on expanding, buying up Lake Central Airlines in 1968 and Mohawk Airlines in 1972 to become the sixth largest airline in the world as measured by passenger boardings, being centred in the booming north-western USA. However, it's long reputation for bad service also has long roots, with Allegheny Airlines having the nickname "Agony Air" due to customer complaints. It tried to rebrand to get away from this, and changed its name to USAir in 1979 – this of course brought about the nickname Useless Air – and it expanded into the southeastern United States, and started servicing the rapidly growing Florida markets. By now the world's largest operator of DC-9 aircraft, it needed more aircraft with more seats, and so USAir became the launch customer for the Boeing 737-300, working closely with Boeing during its development to ensure it was the right plane for the company and it took delivery of the first plane in 1984. US Air carried on with its successful strategy of buying up other airlines, and bought out Pacific Southwest Airlines in 1986, which gave USAir its first routes to the West Coast, and Piedmont Airlines in 1989 - the largest merger in airline history - which added new hubs in Baltimore and Charlotte, which is now one of the main bases for US Air. Despite this, maintenance and other operations remained at the Pittsburgh hub. In 1990 US Air was on the verge of merging with British Airways. At the time BA was the owner of a quarter of US Air, and even got to the stage of painting some US Airways Boeing 767 aircraft in BA colours, which were used as the domestic link from a long-haul BA service. BA also invested in a new terminal at US Airways hub at Pittsburgh. This agreement ended in acrimony and the courts, once BA announced that AA was a better partner, and with BA collecting around 80% of the revenue from the venture. With the agreement falling apart, US Air expanded its service to Europe in 1997 with flights to London, Paris and Frankfurt from its four primary hubs, and bought a fleet of seven new Airbus A330s to operate them (although it also announced options for up to 30). It couldn't get access to London Heathrow, so instead used Gatwick, and built a large new US Airways Club at London Gatwick. At the same time US Air announced that it would change its name to US Airways and introduce a new corporate identity and logo, a stylized version of the Flag of the United States. In September 1994 a US Air Boeing 737 slammed into the ground near Beaver, in Pennsylvania, due to an uncommanded rudder deflection. All 132 people on board died. In 1996 it also launched a low-cost airline, called MetroJet, at the same time as many other grandfather airlines launched off-shoots, and placed an order for up to 400 Airbus A320 aircraft; at the time, the largest bulk aircraft request in history. In 2000 it also launched an abortive salepitch, to be sold to United Airlines. The complex deal fell apart under regulatory scrutiny, and United withdrew its purchase offer in July 2001, paying US Airways a US$50 million penalty. US Airways was badly hit by the US-wide airspace closure following the September 11 terrorist attacks, because it is the largest carrier at Washington-Reagan airport. With finances in turmoil, it closed the embryo MetroJet network, and entered Chapter 11 bankruptcy in 2002. Following a trial run of selling in-flight food in 2003, US Airways discontinued free meal service on domestic flights later that year. The troubled airline only just managed to stay aloft thanks to an emergency government loan, and looking for economies, tried to negotiate better financial terms at its main hub at Pittsburgh Airport, where it operated over 600 flights a day, and many international services. The Allegheny County Airport Authority said no, and so US Airways moved traffic to rival hubs in Philadelphia and Charlotte, and slowly reduced traffic to the stage where it is now not even a focus city, and there are only 39 departures a day, and none internationally. The airline joined the Star Alliance in May 2004, and de-emphasised its hub-and-spoke system, with direct flights between many airports on the eastern seaboard. It then lapsed in to Chapter 11 bankruptcy protection again in 2004. US Airways also looked at a merger with America West, but again the talks failed: the third time it had sought a suitor, and the third time it had failed, but eventually after another round of talks in May 2005, both airlines officially announced the merger deal, with finance from Airbus and Air Canada. 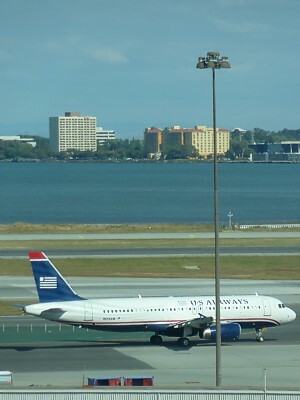 In January 2006, the airline began consolidating its operations under the US Airways brand, and all America West flights were branded as US Airways flights. Since the merger, US Airways has been headquartered at the former America West corporate offices in Tempe, Arizona, although operations were not fully integrated until October 2008. With fresh confidence in 2006, US Airways bought a small fleet of Embraer 190, and also ordered 20 new Airbus A350 aircraft. It also launched an abortive takeover bid for Delta, which quickly failed. These were followed by talks to merge with American, and even United. In 2007, US Airways announced nonstop service between Philadelphia and London Heathrow Airport, its first service to the airport, and somewhere it had tried for many years to operate to. The airline however retained its existing nonstop service between Charlotte and Gatwick Airport, but only once a day, and closed the US Airways Club there. US Airways was still notorious for not having any inflight entertainment. It invested heavily installing Verizon Airfones, but with the failure of this service, in 2007 all the phones were removed. Instead in 2007 it began upgrading its in-flight services, from food and entertainment, and planned to test-market a new seat back entertainment system in early 2008, however the rise in fuel costs in 2008 to $131 a barrel meant that it was no longer economic to carry so much weight on the aircraft, and these plans were scrapped, and it end its existing in-flight entertainment on all domestic routes, by removing bulky and heavy CRT inflight monitors. There was already no free food on US Airways, but in 2008 US Airways went one better and stopped handing out complimentary beverages. Faced with a backlash, US Airways resumed serving complimentary drinks in March 2009. In November 2008 despite being downgraded from a major hub to having virtually no flights in a row over fees, Pittsburgh International Airport won a three way competition between Phoenix and Charlotte for the right to continue as US Airway's Global Flight Operations centre, with a new centre costing US$25 million. In one of its most spectacular crashes, US Airways Flight 1549 flying from New York to Charlotte ditched into the Hudson River in January 2009. The crash was caused by multiple bird strikes from Canada geese. In December 2009, US Airways started the flight to Rio de Janeiro-Galeão airport operated by a Boeing 767-200. This is the first route to South America. However domestic routes were in a sorry state, an in 2010 US Airways axed many flights to at Las Vegas, Boston, and New York LaGuardia.